When you are a caregiver for a senior relative, you know that being able to cook for his or herself can help promote his or her feelings of independence. However, physical challenges can sometimes make cooking alone dangerous for seniors. 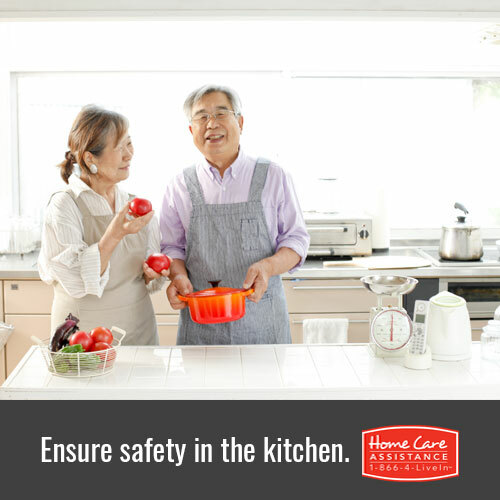 In this article, senior care experts at Home Care Assistance of Harrisburg outline 5 tips for senior safety in the kitchen. If your loved one has physical or mobility challenges, like tremors or difficulty standing for long periods, he or she should no longer cook alone. Instead, a family member or an hourly caregiver in Harrisburg should always be with your loved one while he or she is preparing a meal. Though your loved one might rather cook by his or herself, your loved one might find that having the assistance of a family member or caregiver is helpful or even enjoyable. If your loved one’s kitchen has a gas stove, it’s important to take certain precautions. Never allow your loved one to wear long sleeves while cooking as the cloth may accidentally drift into an open flame. Additionally, as stoves are usually silent, it can be easy to forget that a burner is on after a dish is made. Make sure that your loved one always checks that all of the burners are turned off after cooking. For kitchens with electric stoves, it can sometimes be difficult to tell if a burner is hot. Make sure that your loved one is aware if a burner was recently in use to help prevent touching a hot stove. Likewise, it can be difficult to tell by sight if a pan handle, plate, or utensil is hot, so help your loved one avoid accidental burns by testing the temperature of the metal with a quick touch. Periodically go through your loved one’s fridge and pantry to make sure that none of his or her food has expired. Especially if your loved one no longer does his or her own food shopping, he or she may not realize how long ago certain foods were purchased. As some seniors have a diminished sense of smell, they may also have difficulty detecting food that has gone bad and may accidentally drink sour milk or eat other old foods. Particularly if your loved one requires a mobility device, he or she should avoid carrying heavy pans, plates, or other kitchen supplies. Slips while carrying heavy loads can lead to serious injury or burns if hot food is spilled in the fall. Instead, make sure a family member or caregiver carries anything particularly heavy to avoid any incidents. For many seniors who face mobility challenges, being able to cook can help maintain his or her feelings of independence and accomplishment. At Home Care Assistance, our expertly trained caregivers can provide mobility assistance and help with meal preparation, ensuring that your loved one can continue cooking if he or she wishes. For senior stroke survivors who enjoy cooking, our stroke recovery care in Harrisburg may also provide the physical assistance he or she needs to be safe in the kitchen. To learn more, contact a Care Manager at (717) 540-4663 and schedule a complimentary in-home consultation.